The TAC PRO® Kydex® adjustable Strap-On Cheek Rest has been designed to provide perfect eye alignment with the sighting system without compromising functionality. 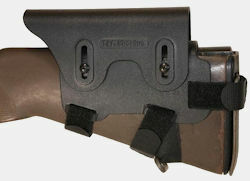 THIS STRAP-ON, AMBIDEXTROUS CHEEK REST HAS BEEN DESIGNED SPECIFICALLY FOR THE M14/M1A GI STYLE STOCK. Through careful attention to detail, TAC PRO® design team has created a strap-on cheek rest that fits M14/M1A GI Style stocks. It has the same shape as the Rifle Strap-On Cheek Rest and is only slightly wider ( .050") at the top, where your cheek is resting. The TAC PRO® Strap-On adjustable cheek riser solves this problem with an ergonomic design and tool-less installation. Installs without tools and without drilling holes. Adjusts from .75" to 1.75" above the comb. Form fitted to M14/M1A stock and precision formed. Fits all variations of GI style M14/M1A stocks. Easily adjusted without removing from stock or disassembling. Thin, chemical resistant rubber lining prevents scuffing of stock. In most cases, the cheek rest can be adjusted for use with iron sights. Made from .125" thick Kydex© 100 for maximum durability.